Seeing as this beer was prepared with the same types of chiles found in molé sauce, which also uses chocolate, I was a bit timid of trying this beer. Yes, I am a Mexican, and No, I do not like molé sauce. What a shocker, right? Since I love beer, though, and experimenting, I said “what the Heck” and bought me a six pack (could not find this in single cans). I also seem to like the beers put out by Ska Brewing, so we shall see where this one rates. Poured into a Porter/Stout glass, the beer poured a very dark brown, near black color. It’s very dense, nor very see through at all. There is a good amount if rising carbonation bubbles, leaving a good pinky finger wide bubbly tan head, which did retain well, and left good, sticky lacing down the glass. The aroma of this beer was impressive. Good amount of the chile aroma is there, along with some chocolate, spices, and cinnamon. Nothing was very abundant, though. I felt it was a good combination, and inviting. The taste is similar to the aroma. For me, I got the sweet chocolate flavor at first sip, with a coffee-like flavor in the body, and the spices at the end of the drink. The whole time, the chiles are there in the background, giving this beer a bite, and a hint of hotness to it. nothing was overpowering, so that made it east to drink for me. I have had some chile beers where the chile is so upfront or overpowering the rest of the flavors, that it is not very enjoyable. 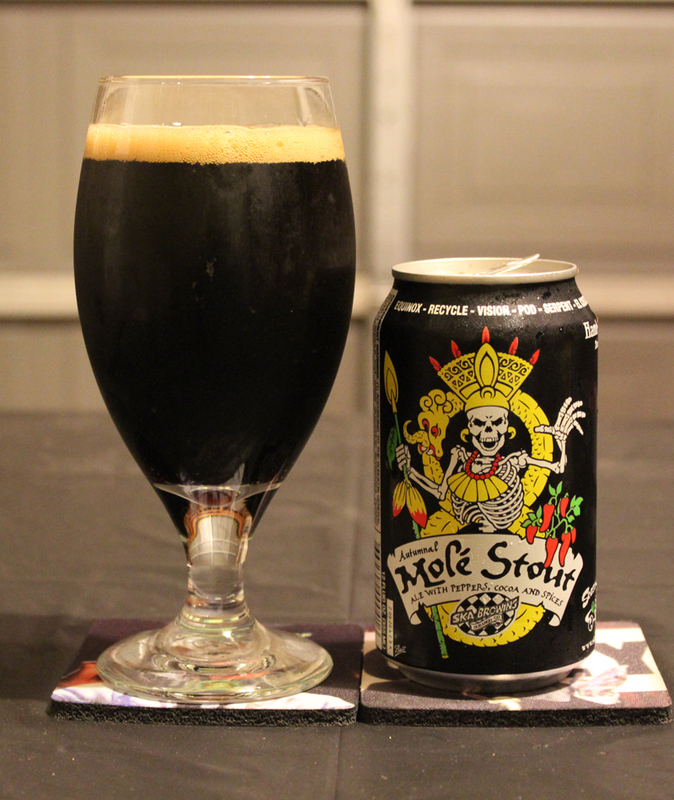 I do find this Molé Stout to be a lot different. I actually enjoy this beer. The body is a medium thickness, and the mouthfeel is smooth with a crisp, spicy finish. Overall, I will say that I am impressed by this beer, even though I was afraid of it before ever even trying it. So this is just another case of don’t knock it until you try it. I will still be hesitant when it comes to chile beers, but at least I can say that I drank and enjoyed this beer. Way to go Ska! Metal Connection: Cliche, yes I know, but what better way to pair a chile been named after a Mexican cuisine, than with a Mexican band. I’m sure most of you have heard about this band in one way or another. This is BRUJERIA, and their song “La Ley De Plumo” from their 1995 album, Raza Odiada.